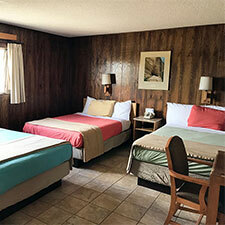 The White Eagle Inn is AAA Approved with sixteen ULTRA-CLEAN motel rooms and one 1500ft 3BR/2BA Vacation Rental. All rooms are non-smoking and at ground level. The outside area features a covered picnic area with views of Mesa Verde National Park and Sleeping Ute Mountain. 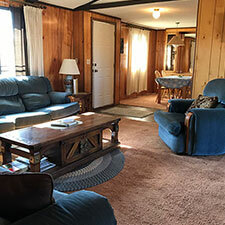 The White Eagle Inn is an old fashioned, family owned and operated lodging facility which has been in continuous operation for over sixty years. It has its own unique character, and the owners/hosts are almost always on-site to welcome you. In our one-bed rooms, we offer both King and Queen-sized beds. These rooms sleep up to 2 individuals. 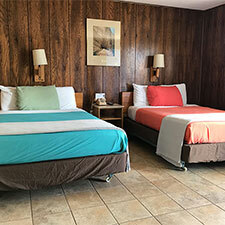 Each room (non-smoking) is complete with a private bathroom, and there is a coffee maker, mini fridge, flat screen cable TV, air-conditioning, and wifi. .
For our two-bed rooms, we offer rooms with 2 Queen Beds and rooms with 2 Double Beds. These rooms sleep up to 4 individuals. Each room (non-smoking) is complete with a private bathroom, and there is a coffee maker, mini fridge, flat screen cable TV, air-conditioning, and wifi..
For rooms with three beds, we have two styles available. Our rooms with 3 Double Beds sleep up to 6 individuals. Our family rooms have 2 Queen Beds and 1 Single Bed, and sleep up to 5 individuals. Each room (non-smoking) is complete with a private bathroom, and there is a coffee maker, mini fridge, flat screen cable TV, air-conditioning, and wifi. 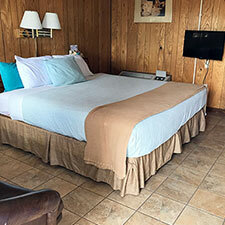 White Eagle Vacation Rental is a spacious 3 Bedroom, 2 bathroom house with a laundry room. It includes a King room with private bath, one Queen room, and one Queen and Single room. It is available for families and small groups year round. It features beautiful views of Mesa Verde.